Last year I resolved that if I was going to occasionally indulge in a latte or two, I should do a better job about bringing my own cup. I must have expressed that I was on the look out for a good reusable cup because my husband bought me a fancy stainless steel cup that came with this neat little tea basket for loose leaf tea. It’s purple and pretty cool. He did a lot of research and spent a chunk of money. The mug has this intricate press top button to make it spill proof when the button was pressed down. I drink a lot of tea, and it was fairly useful. But… then it became harder and harder to clean. It was tall and skinny and I couldn’t fit my sturdy paw down into it to really scrub the bottom. Yes, I tried salt and vinegar. You also could not take apart the top to thoroughly clean out the lid. I also could not microwave it or put it in the dishwasher. All these cleaning difficulties made it unpalatable to switch up between coffee and tea, or put anything with milk into it. So yes, it was pretty. But with limited function and was very high maintenance. Kinda the total opposite of me. Even before I knew that I was searching for an alternative, I walked into Starbucks and saw a stack of cups at the checkout with a little tag that said $1. They are plastic and reusable and I can throw them in the dishwasher and the microwave and they have a nice lid that is a single, easy-to-clean piece. They were even BPA free! However, this article was not supposed to be about the Starbucks cup, or my mug woes. It is actually for a craft project that resulted from the purchase of this cup. Because in order to sell these cups for $1 and ship them from China, Starbucks made them with really thin plastic. That means they get HOT when you drink any hot beverage out of them. They are, in fact, painful to hold. I resolved to make something I could use at home for protection since I did not have a container of cardboard sleeves at my disposal. 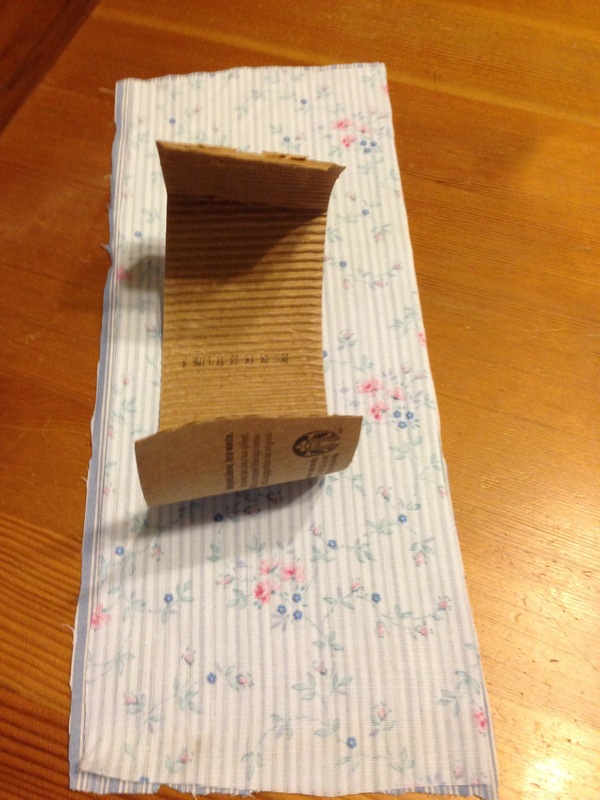 Plus, these reusable sleeves would allow me to avoid paper sleeves at the coffee shop. I dare you to screw up this project. I nailed this on my first try. Not to brag or anything. This project was even a bit easier than many of my projects because I actually had a pattern (a paper sleeve from the coffee shop) instead of totally winging it. Below are the items you will need. I actually ended up adding some fusible webbing to stiffen things up because I used some pretty flimsy cotton fabrics. However, on my next try I would probably use upholstery fabric remnants and then I would not have to use the webbing, I think. 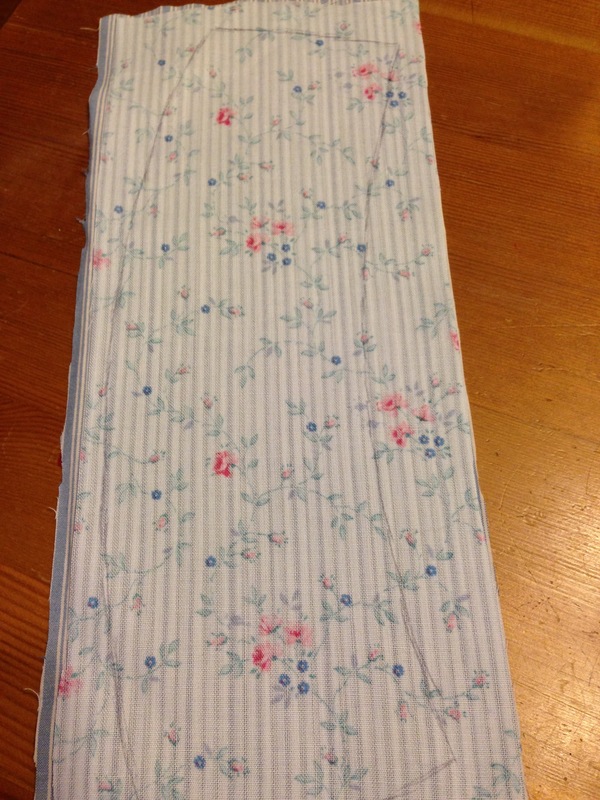 To start this project, I took apart the sleeve and laid it on my fabric. I then cut two, identical pieces of fabric in a generous rectangle, providing at least an inch on every side of the sleeve. Place your fabrics ugly sides together and trace out the sleeve adding about 1/4-1/2 inch around the edges of the sleeve. I totally eye-balled it and it was fine. Unfortunately I skipped a photo here. I ran up to sew the seams and left my phone downstairs. The photo would have been an unpinned, 3/4 sides sewn version of the sleeve above, still wrong-side out. Remember, you left yourself about 1/4 inch around the edge, so remember not to sew farther in than what you allowed. Leave one of the short ends unsewn since you are going to flip this inside-out later. After it is sewn, you may trim the piece EXCEPT for the side you did not sew. At this point, I decided my sleeve was going to be pretty limp on its own and I cut out a piece of two-sided fusible webbing. This is a Bosal Craf-Tex brand and you iron it down after inserting and it sticks to the fabric. I have gotten a lot of use out of this product, which I originally bought to make coasters last Christmas. The package of placemats I bought made A LOT of coasters and I happened to have a leftover strip. In any case, even it you didn’t decide to add things all willy-nilly mid project, this is when you would measure out the webbing as it has to actually fit inside the sleeve. Cut out your strip of webbing so that it is just a touch smaller than the seams. Just a touch– like1/16 of an inch. At this point, you can turn your sleeve right-side out and insert the webbing. It should fit snugly. I like to leave a bit more fabric on the end I did not sew because it makes it easier to tuck the ends inside without losing too much from the ends. 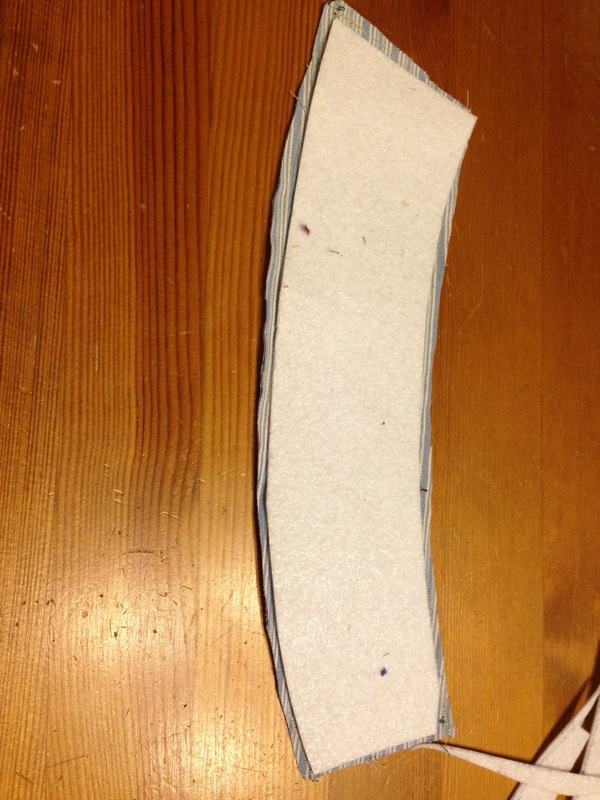 I folded the ends into the sleeve and then finished sewing the sleeve. I did not get tricky. 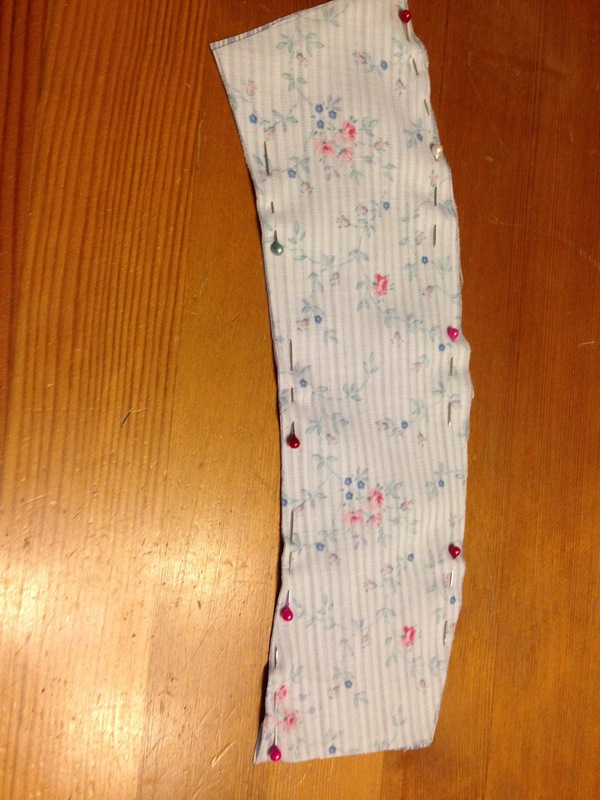 I simply sewed a straight seam on the end. With the use of the fusible webbing, I had to iron the sleeve before I hand-stitched it. I started out this project making sure I traced out where the ends of the paper sleeve met, but in the end realized that this is a pretty forgiving pattern–though you can go too small. 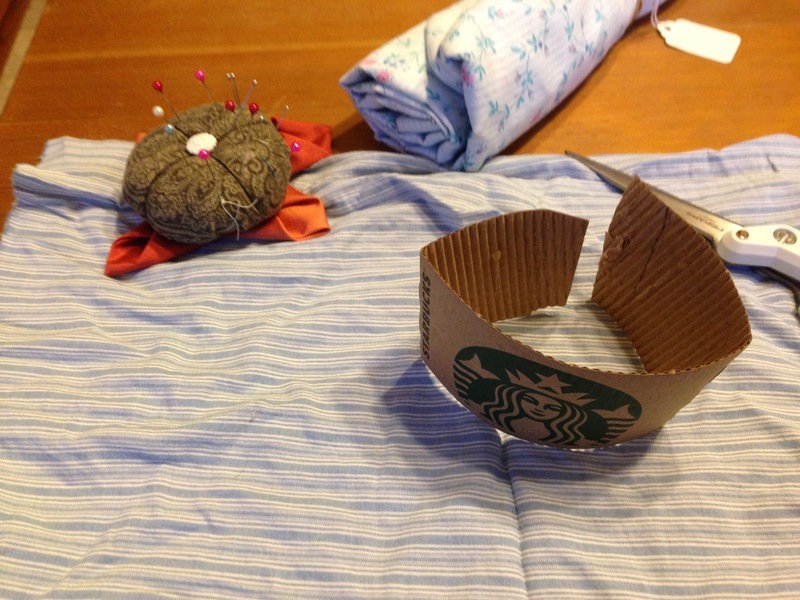 I just grabbed my thin, plastic cup and visually observed where I needed to start stitching. Then I stitched. This was a really quick project and it turned out pretty well. While researching the Starbucks cups and its safety before I admitted to using it, I came across this fun blog called The Greening of Westford. The Blogger here had a similar experience with the volcanic temperature that seeps through the cup. Her solution was cute, clever and super quick: the top portion of a sock! A great alternative and a great reuse for socks, which I think are often difficult to repurpose. Sweater sleeves would also do the trick. 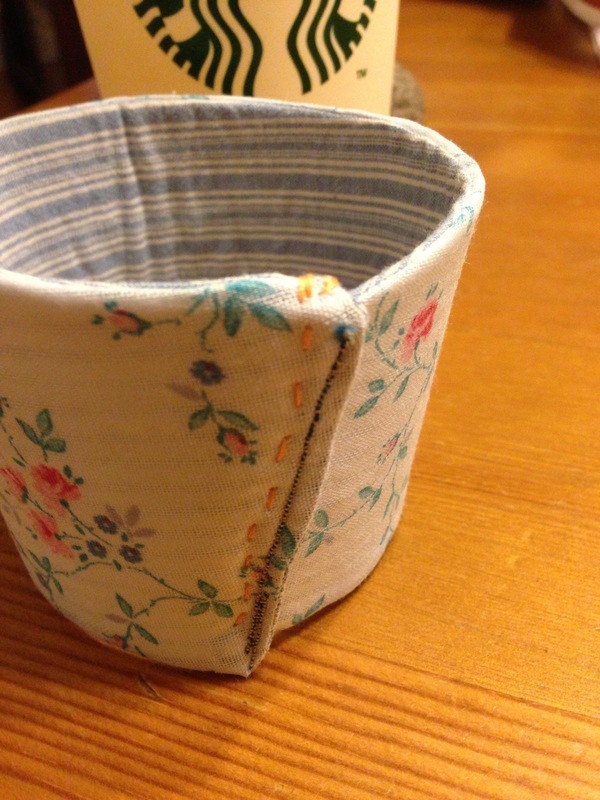 Please share your ideas for coffee cozies. I would love to share it. And do not be shy about sharing this project. This entry was posted in Every Post on this Awesome Blog, Your Creative Health. Bookmark the permalink.